Pre-sterilised and ready for use out of the box. * Gusseted bottom allows bag to stand upright. 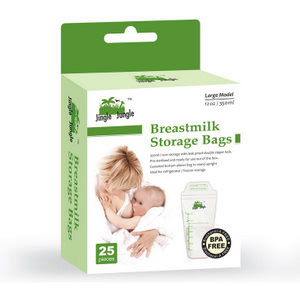 * Recyclable JJ note: Jingle Jungle Breastmilk Storage Bags are for one time use only but can be recycled into trashcan liners and cans, compost bins, shipping envelopes, paneling, lumber, landscaping ties, floor tile and etc... Please clean bags before recycling. how to order? pls email me illinadiah@gmail.com tq. Hi where are you located? Boleh I datang pick up sendiri?